3 years ago today I was onsite doing post support of a IT system migration for an accounting firm. We’d just had lunch and I was heading back to the server room. I’d just got to the doorway when the earthquake hit. Next to me, were huge filing cabinets, the drawers started flying open and shut and then they started crashing over. The ceiling tiles started falling into the office. Then the power went out. I was frantically trying to shutdown the server when my workmate Brett put his arm over my shoulder and said “it doesn’t matter”. That snapped me out of it. I’m not sure if I muttered “silly cow” to myself or the thought just ran through my head. I grabbed my bag and we left the building. For a few minutes we sat outside as more huge aftershocks hit. Checking that others who had evacuated the building were all ok. With experience we knew if we didn’t leave very soon, we’d be stuck in traffic for hours, so we left. In a great decision, we aimed slightly away from where we wanted to go to avoid traffic, heading away from instead of towards the city. We went along the main road that runs near the airport and then approached the neighbourhood where I live. First stop was my Mum’s place to see if she was ok – she wasn’t there. Next stop Dad’s place, just a few doors away – he too was not home. Very strange as they rarely go out during the week. Then just as we aimed towards my place, Mum’s car came around the corner. She had been out shopping and as soon as the earthquake hit, high-tailed it to my place to pickup my dogs – as they would have been frightened and freaked out with the noise and experience. My partner text me to say he was leaving work and would be home as soon as he could, but with traffic heavy with people trying to get to where they wanted to be, the normally 15 minute drive took well over an hour. Mum knew that my Dad had been in the city, he’d gone to meet my brother for lunch. He arrived home around 3 hours later having had to walk around 10kms home as the buses were not running. Some buses were crushed in the city and the central city was no longer driveable. He had seen buildings collapse, people badly injured and possibly worse. At least he knew my brother was ok. They’d just finished their, what turned out to be, a free lunch. We spent the rest of what should have been a beautiful summer day hearing sirens rushing to assist those injured. Helicopters constantly flying overhead surveying damage and carrying bodies for identification to the army base out of the city. You get to a point where you can’t listen, read or hear any more about the destruction. It just relives it over and again. The following days were taken assisting others. We arranged a working bee through work to assist colleagues and friends who needed help. A group of us moved from home to home helping where help was needed. We started the day clearing liquefaction from my mother-in-law’s driveway, so it was passable for the tenants in the block of flats she lives in. We then went to a colleague’s place where we helped him shift liquefaction from his Mum’s driveway and garage. While there, a neighbour asked if we could help shift an elderly man’s belongings into his garage as his home was flooding. We also helped others in this street clear their liquefaction. Then off to help my boss shift his family’s belongings into a moving truck. 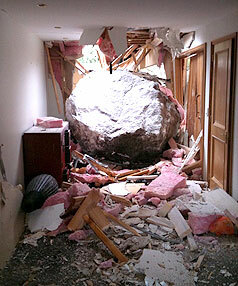 He’d had a massive boulder inhabit his laundry. Their home was not safe to inhabit and if belongings weren’t packed and removed, there was a very high risk that they would not be allowed back into their home to retreive them. I will freely admit I was shitting myself as aftershocks kept rolling through and I knew “Rocky” had fellow rocks on the hill who were no doubt planning to relocate. At least Rocky did some good in the end as he was auctioned off to raise over $50,000 for the Christchurch Earthquake Relief Fund. In those early days following the quake, Rocky became somewhat of a celebrity with his own Facebook page. I can’t say I was happy to meet him in person, though amazingly, I was able to channel him in order to respond to fans on Facebook in the early days. 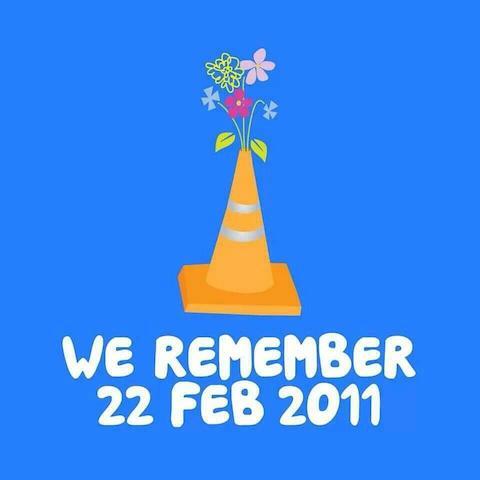 So three years on, we remember those who lost their lives and the city that was – placing flowers in the thousands of road cones that scatter the city is our way to show our respects.